Kishore Kumar » Blog Archive » Kishore the singer – King of all trades..
Home » Kishore diary » Kishore the singer King of all trades.. There are always those who excel in something when they put everything into it. That is quite a commendable achievement as most people do not achieve success in their chosen fields or professions. But then, there is also a different category altogether – those who do more than one thing at a time and excel at everything they do. It’s like having a Midas touch – everything you try turns to gold. The world adores such people and it also loves to hate them, in a way. It pokes in some deep recess of every person’s mind that someone exists who loves to do more than one thing and does it well. So while the respect and admiration grows for them openly, they unconsciously or consciously revel in their failure too. One such person was Kishore Kumar – born as Abhas Kumar Ganguly. When he came to the city of Bombay as young man, his brother Ashok Kumar was quite successful in films. Expectedly, one would say it would have been logical to follow in his footsteps. Though Kishore was all set, there was something that fascinated and interested him a lot more – singing. He was not a trained singer but as some say talent is something you are born with. Though raw, he was great at picking things up like his famous yodeling. In his initial days when no one took him seriously as a singer, he used to imitate the great Saigal Saab until he was made to realize that he needed to develop his own style. As he started making it as an actor, there were those who believed in his singing capability. One of his earlier breaks was given by Khemchand Prakash and Kishore Kumar did the playback for the film Ziddi. Then a messiah came in the form of S.D. 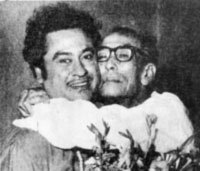 Burman and they both forged a deep bond that lasted for very long. Soon Kishore was regarded as Dev Anand’s voice and did score of films like Munimji, Taxi Driver, Fantoosh, House No. 44 being a couple of them. He also has some timeless classics with Asha Bhonsle like the songs from Chalti Ka Naam Gaadi – all becoming extremely popular. A score of people were clamoring for Kishore now as they finally stood up and took notice. 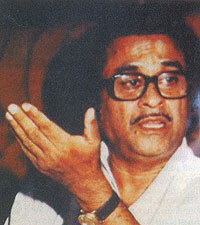 Big music directors like Laxmikant- Pyarelal and Kalyanji-Anandji started working with him on a regular basis. Kishore Kumar finally got what he wanted. But that was not all that he wanted. During his lifetime, he sang, acted, directed, produced, wrote – all these getting him commercial and professional attention. He did everything that he wanted to do and because of his take on life, he became one of those special people. Counted amongst the finest singers that Bollywood has seen, one thing that was totally unique about him was that he excelled at singing because of his desire and inner talent, not to mention hard work. This gives inspiration to all those out there who get dissuaded just because they don’t have professional training. As mentioned before, many people term such gifted people as eccentrics and Kishore was no different. But there was something he taught us all – if you want something bad enough and work hard for it, there is little chance that what others speak is going to affect you. You see, he taught us a lot more than just to listen to his eternal voice. This entry was posted on Tuesday, May 22nd, 2007 at 8:24 am	and is filed under Kishore diary. You can follow any responses to this entry through the RSS 2.0 feed. You can skip to the end and leave a response. Pinging is currently not allowed. No Kishore……. Md. Rafi & Manna Dey were the greatest of all times…… and the third position must be for KUMAR SANU…..
« A Man of Many Moods..